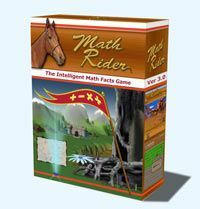 As part of The Old Schoolhouse Homeschool Crew, I received a 2 month trial of Math Rider The Intelligent Math Game. 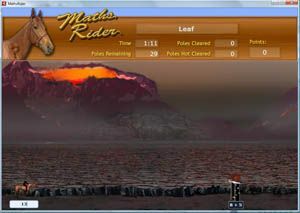 Math Rider is a math facts game designed for children between 6 and 12 years of age, which would be grades 2-6. Math Rider can be installed up to 3 times, including on different computers in your home, and can be used for multiple children. That makes it great for homeschool families! From the website: MathRider is a game that takes you into a land of magical adventures where fun, excitement and great rewards await, while helping you to achieve perfect mathematics skills in your times tables and division. The main game is played riding through the Mathlands. The Mathlands contain various different magical realms where you need to jump over obstacles by answering questions (number sentences) correctly. These are screen shots from the Math Rider game. From website There are three basic quests in the game. One for easy, one for medium and one for advanced difficulty. At the end of the advanced level quest there is a further Master level quest. Each quest involves the rider in a storyline with a need to ride through the Mathlands for great and noble causes. It is highly recommended that you start with the easy level quest in the operation of your choice (addition, subtraction, multiplication or division) and move up from there. If you are already quite expert in say addition, you may go straight to advanced, however then you will also miss out on the rewards that the addition easy and addition medium quests offer (more on quest rewards below). The Master level quest only becomes available once the rider has acquired mastery over an operation. For example, once you have completed the advanced multiplication quest with 99% or better mastery, the king will have a special request for you, making the master level quest in multiplication available to you. I used Math Rider with my 11 year old, 5th grade son. He loves it! He loves the story line and the map in between “rides”. While on rides, the student solves 30 problems. The map screen then comes up and shows the student their score, and how far along in the quest they are. Here is a Math Rider video so you can get a feel for how the game is played. This is a Math Rider video, not mine, and it accurately portrays our experience with the game. 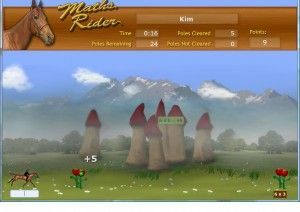 Math Rider is an excellent game for kids to practice and master math facts. All four math functions are played in the game, so the kids can develop a real mastery of elementary school math. 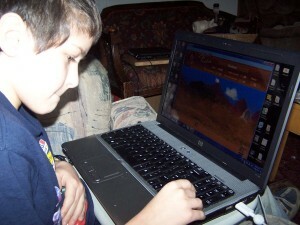 My son playing Math Rider. You can tell he’s concentrating by his lips. lol He asks to play Math Rider every day. That’s how much he loves it! The story line in Math Rider is about Kings, Queen, Princess’s, wizards and spells. Unfortunately, they used wizards and spells in the story. We don’t normally use any curriculum with this story line. Fortunately, the story in Math Rider is drawings and narration, as you can tell from the video above. So while there is mention of wizards and spells, nothing is actually shown. I wanted to share that information, as I know there are other families that don’t allow this story line. Overall, though, I was happy with the program. It really does help with the children learning mastery of math facts. If an 11 year old boy asks to play every day, it must be fun! You can get a Free 7 day trial of Math Rider! 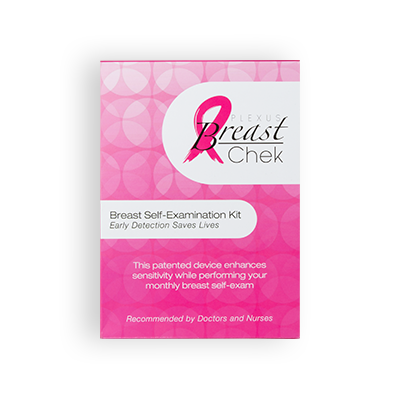 Try if with your kids for a week, see if it works for your family before buying. Right now you can buy Math Rider for $37. This special price is available until February 15th, after that, it goes back to it’s original price of $47. See what other Homeschool Crew members are saying about Math Rider. I may have to try it out. I’m always looking for ways to drill my 2nd grade in math facts that is more fun than flashcards.